Expected growth in construction market, rising crime rate, upcoming new hotels & shopping malls, coupled with increasing urbanization rate are some of the few factors that have resulted in the overall growth of video surveillance market in South Africa. In South Africa's video surveillance market, IP video surveillance segment accounted for majority of the market revenue owing to major deployments in government & transportation vertical. However, in terms of volume, analog video surveillance systems accounted for majority of the volume share owing to low pricing and accessibility. According to 6Wresearch, South Africa video surveillance market generated $72.3 million in 2015. Weak economic conditions and currency depreciation have resulted in rise in ASP of video surveillance systems during 2010-15. Amongst all the verticals, government & transportation acquired largest revenue share of the market pie in the country. Over the next six years, commercial offices and healthcare & hospitality verticals are forecast to grow at relatively higher CAGR from 2016 to 2022. Gauteng Province has accounted for the largest share in the market revenue due to growing construction activities in commercial and retail verticals. During the forecast period, Mpumalanga province region is forecast to grow at relatively higher CAGR from 2016 to 2022. The report thoroughly covers the market by video surveillance types, by verticals, and by regions. The report provides unbiased and detailed analysis of the on-going trends, opportunities/ high growth areas, market drivers, which would help stakeholders to device and align market strategies according to the current and future market dynamics. 13.3	Bosch Security Systems, Inc. Growing construction market along with increasing crime rate in the country has resulted in the growth in market for Video Surveillance in South Africa. Further, growing government spending towards the public safety and security are the few factors that are spurring the market for video surveillance in South Africa. In South Africa, video surveillance market is primarily driven by government & transportation vertical followed by commercial office and banking & financial institution verticals. However, hospitality vertical market is expected to experience a major growth in the forecast period attributed to growing tourism industry and rising security concerns in South Africa. Amongst all the regions, Gauteng province has generated largest revenue share of the market pie in the country and would maintain its market leadership through the forecast period as well. 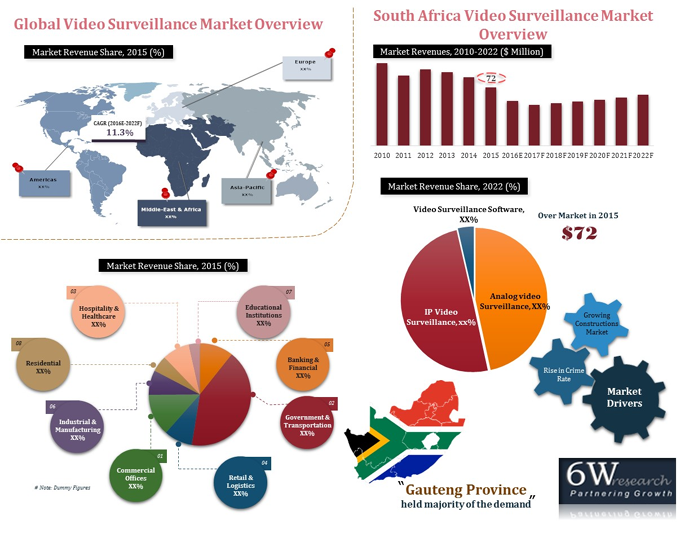 “South Africa Video Surveillance Market (2016-2022)” report estimates and forecast overall South Africa Video Surveillance market by revenue, by volume, by types, by verticals such as banking & financial, government & transportation, retail & logistics, commercial offices, industrial & manufacturing, residential, hospitality & healthcare and educational institutions and by region such as Northern Cape, Eastern Cape, Western Cape, North West Province, LimPOPO Province, MPU Malanga Province, Free State Province, Kwazulu Natal Province and Gauteng province. The report also gives the insights on market trends, company profiles, market drivers and restraints.